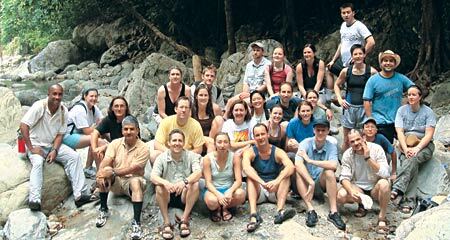 Hayden (yellow t-shirt) and the entire Rare staff take a break from working near Pico Bonita National Park in Honduras. Daniel Hayden '01 is quite literally helping to save the world. With a background in marketing consulting and previous employment at Arthur Andersen and MarketBridge, Hayden's résumé doesn't mirror those of most not-for-profit executives. In his current position as director of global programs at the U.S.-based conservation organization Rare, the Kellogg School graduate has seen tremendous value in applying his MBA for the greater good. "There's a perception that the skill set of not-for-profit is different from the private sector," Hayden says. "But the things I do are very much the types of things a management consultant does: to focus on deliverables, to set a plan with deadlines, to do smart analysis. Increasingly, not-for-profits are going to be held to higher financial and organizational standards that an MBA-type of profile can provide." 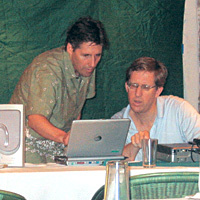 Global guru: Rare CEO Brett Jenks (left) works with Daniel Hayden in Honduras. 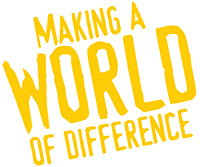 At Rare, Hayden found a forum to merge his professional talents with the noble goal of making the world a better place. Rare works with local groups in environmentally threatened areas to build awareness about conservation and develop concrete plans for change, addressing social and economic factors as much as scientific ones. Rare's first project, back in 1974, was the now-famous "Save the Whales" campaign. As global program director, Hayden monitors 50 international grassroots social marketing campaigns to make sure they're meeting their goals. He also serves as project manager for Rare initiatives that are cross-functional or that are too big for any one group to take on. With about 50 employees, Rare qualifies as a small nonprofit. "But the leverage of the organization is much bigger than that," says Hayden, a graduate of the Kellogg Part-Time MBA Program. "For every Rare person, we have three people in partner organizations working on our activities." Those partners include environmental heavyweights like The Nature Conservancy and World Wildlife Foundation. "We are successful because of our partners," notes Hayden, but these relationships also validate Rare's own successes, since "organizations that are at the top are choosing to work with us." Rare's efforts have been recognized widely, including by Fast Company, which bestowed its "Top 25 Social Capitalists" designation on Rare in 2005, 2006 and 2007. One of Hayden's current projects is rareplanet.org, a suite of online tools that is set to launch in July. The site includes three main components: a Facebook-style online collaboration tool for Rare's campaign managers; an online "threat reduction" community that convenes experts to address specific conservation threats; and a performance management tool, which allows Rare's campaign managers and stakeholders (including donors) to monitor each program's progress. Hayden's work at Rare allows him to pair traditional notions of success along with the more lasting value of significance. "I really do believe every single day that I'm making some kind of contribution to solving one of the most important issues that's facing us in the next 50 years," Hayden says. "Rare is addressing questions like how we live on earth, how we interact with the earth and the environment, and how we're going to change our behavior going forward." That's pretty heady stuff, compared to typical MBA courses like operations management or basic finance. But Hayden points out that the Kellogg team-oriented perspective — and key courses and professors, like business strategy with Michael Mazzeo and technology with Anthony Paoni — formed a solid basis for his work today. "At Kellogg, probably the most important thing I learned was the focus on time management, getting things done while managing conflicting commitments," Hayden says. "The second-most important was the focus on teamwork and collaboration. In the real world you can't be a superhero who takes care of everything; you have to work with others and trust other people to make things happen."